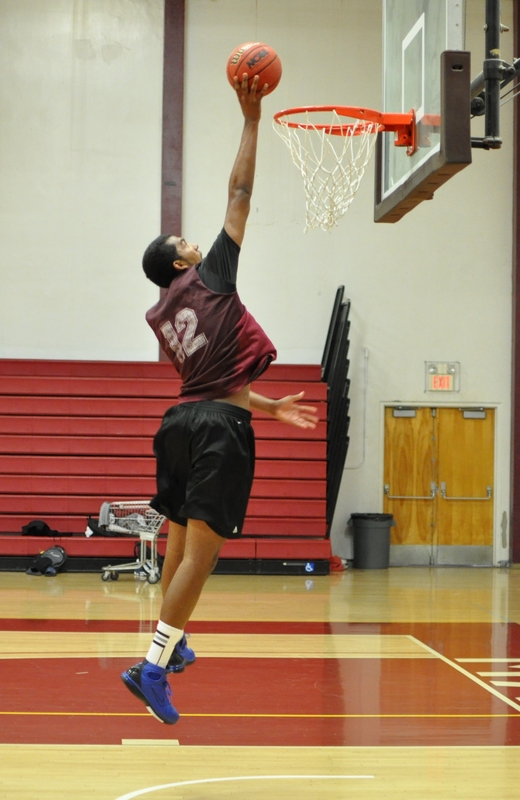 Zackary Hollis, 6’9” 225 local front court big man from Knight High School in Palmdale, California, has joined the basketball program at Antelope Valley College. Zack is a Post/Forward who is still growing and has good length and is a active rebounder. Of all of the players on the floor, he is picking up basketball skills more rapidly due to playing/with against AVC’s skilled front court of sophomores Dwan Caldwell, 6’8”, 245, Larry Slaughter, 6’8”, 225, Vadal Faniel, 6’6”, 205. Hollis is unique in a number of ways; He is a “qualifier” with a 3.6 GPA out of high school, he has a D-1 low mid-major offer, Zack is the first player in the gym and the last to leave. In addition, Hollis was the Captain of his basketball team at Knight High School. How much will Zack bring to the AVC team this year? Good question. He has a start of a good outside shot. He is a beast on the boards. He takes up a lot of space in the paint. Zack has a lot to learn but he is smart and a hard worker. Should be fun to see where he is at in November. Zack adds important depth in the front court for the marauders. Of all of the AVC players, Zack improved the most. He was the first in practice and the last to leave. He attended more 1-1 training than any other player. He played in all 8 summer showcase game and found out what it was like to play against experienced “Bigs” in the paint. He is a natural rebounder and learns very fast. Great summer for Zack.